But now the iPod product line is on its last legs. And while Apple will most likely continue selling them for a few years more, there’s no reason to think the company will do anything to significantly update the current iPod product line. Apple’s iconic music player has reached its twilight years. Portable music devices actually have a long history. For me, it started with an AM radio, which I used to listen to songs that would prompt me to make my first record purchases—music by Three Dog Night, The Guess Who, Grand Funk Railroad, The Beatles and Chicago. Portable radios date back to 1954. They fit in your pocket, didn’t weigh very much, lasted for days on a single nine-volt battery, and had that distinctively tinny sound. But those little radios opened my ten-year old mind to a new world of rock and roll. For years, that’s all we had—other than cars—to listen to music outside the home. That began to change in the 1970s. Near the end of that decade, I bought a Sony Pressman. This precursor to the Walkman was about half the size of a brick, and weighed about as much. I initially wanted it to record music I played with a few friends: it had two microphones and recorded in stereo. But when I wasn’t recording with it, I used it—together with some cheap headphones—as a portable music player. As the 80s started, I was buying music on cassette instead of LP, because of the Pressman. Back then, I was listening to The Cure, Joy Division, and what is certainly one of the best albums of the period: The Clash’s London Calling. Listening to that music in stereo as I wandered the streets hooked me on portable music listening forever. The real revolution came in 1980, when Sony introduced the Walkman, which took the Pressman concept and miniaturized it. This device brought portable listening to the masses, and people wearing headphones soon became the symbol of music listening. 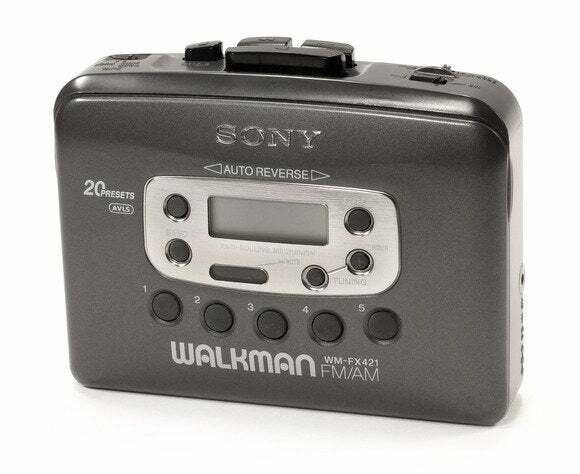 But the Walkman quickly attracted competition, and Sony soon lost its dominance of the market. When I set out to travel around Europe in 1984, I bought an Aiwa cassette player, which had some features that bested Sony’s devices. With a dozen 120-minute cassette tapes—some recorded from my LP collection—I had twenty or so hours of music to accompany me on that journey. And let’s not forget the boombox. In New York City, where I lived, you heard boomboxes everywhere in the early 1980s; you’d see people struggling down the streets with suitcase-sized devices on their shoulders. But the boombox was more of a social tool. I remember hanging out in a park in my Queens, New York, neighborhood, listening with friends to live Grateful Dead tapes on boomboxes; unlike the Walkman, which shut people out, the boombox brought people together in shared listening. In the late 1990s, the advent of the MP3 format led to the first portable digital media players. They were small, yet clunky to use. You had to press buttons to navigate menus that often only displayed a dozen or so characters of a song title or artist name. You had to manually copy music onto memory cards, then insert those into the devices. Without USB, MP3 players didn’t yet connect to computers. The first such player actually wasn’t designed for music, but rather for audiobooks. The Audio Player from Audible.com was a small device released in 1997; with just 4MB of storage, it was designed to play Audible’s low bit-rate audiobook files. Shortly after that, the first hard drive based players were released: the Creative NOMAD and Archos Jukebox both initially shipped in 2000, and were among the first devices that used USB to transfer files. But early USB was very slow, and it took hours to fill their 6GB drives. Apple launched the iPod in 2001—a pivotal year in Apple’s history. Around the same time, Apple was also releasing increasingly innovative Macs, including metal-body PowerBooks, white iBooks, flat-panel iMacs, and, on the software side, the first versions of Mac OS X (10.0 Cheetah and 10.1 Puma). Apple wouldn’t innovate that much in such a short period of time again until the 2007 release of the iPhone. Just as the Sony Walkman wasn’t original—there had been other portable cassette players before—the iPod was built on existing MP3 player designs. Yet Apple figured out a way around the most annoying aspect of those earlier devices—the problem of transferring music to them. Apple had released iTunes—which let you rip and burn CDs on your Mac—earlier that year. But when the iPod was introduced, iTunes took over the task of moving music to that device. You no longer had to drag and drop files and folders to a device to move music. And, with 5GB storage on that first iPod, most people could copy their entire music libraries automatically to their iPods. Without iTunes, the iPod might not have succeeded. 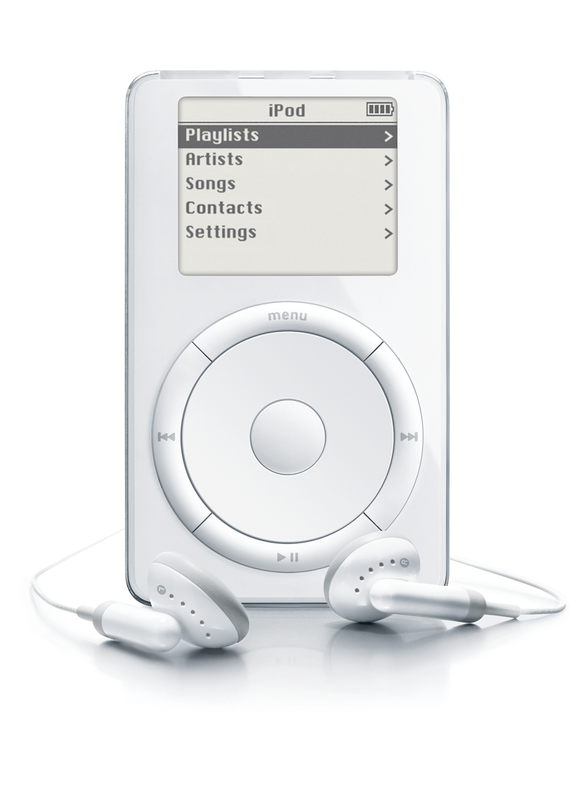 With the release of a Windows-compatible iPod less than a year later, the iPod generation took off. Apple now was all about music, and the iPod was its flagship product. With upgrades to the initial iPod and new models released annually, Apple’s product presentations often ended with bands playing their latest hits. From U2 to Coldplay, Apple courted the most popular artists to tout the devices that could play their music. It seems like it was only yesterday when the iPod was the world’s hottest consumer-electronics gadget. But just as the once mighty Walkman faded away, so is the iPod fading away now. In its heyday in 2009, Apple sold some 22 million of the things in the holiday quarter; in the same quarter of 2014, it sold 6 million, a drop of more than 50 percent compared to the year before. (By comparison, in that same 2014 quarter, the company sold 51 million iPhones.). Once Apple’s cash cow, the iPod represented just over 1% of the company’s overall revenue in the second quarter of 2014, and that decline is expected to continue. Even Apple apparently considers the iPod’s history to be over: Its iPod + iTunes Timeline page ends in 2010. That said, the iPod isn’t dead quite yet. Various versions still rule Amazon.com’s list of top-selling MP3 players, with the iPod touch, iPod nano and—yes—the iPod classic currently in the top five. In some ways, the iPod is now a niche product. It can be great to have a lightweight device specifically for running or exercising. If you want to carry around more music than a 64GB iPhone can hold, the iPod classic will do it. An iPod touch can be great for kids who want to run apps, but who don’t need a phone. And the iPod nano offers 16GB storage for a lot less than the touch, and also has Bluetooth, so you can listen on wireless headphones. Otherwise, the iPod’s functionality has been subsumed into other products, chiefly the iPhone. An iPhone or iPad holds enough music for most listeners, and Apple’s betting heavily on the cloud to provide more music than an iOS device can hold. The long-rumored iWatch (if Apple actually releases it) will almost certainly offer music playback; that'll likely be a core feature on other future wearables, too. Because, while the iPod era might be ending, the personal music player period isn’t likely to end anytime soon. It looks like the world is shifting from music ownership to subscription-based streaming. Any device with mobile data access will be able to handle that, without the need for a lot of storage or syncing. There may come a day when nostalgics will look back and revere the iPod era, just as I recall the Walkman days and the music I listened on those devices. The iPod was a transitional device, but a crucial one. We should never forget that the iPod is in many ways the device that turned Apple into the company that we know today. It is arguably the company’s most important product ever, because it changed the direction of the company entirely.